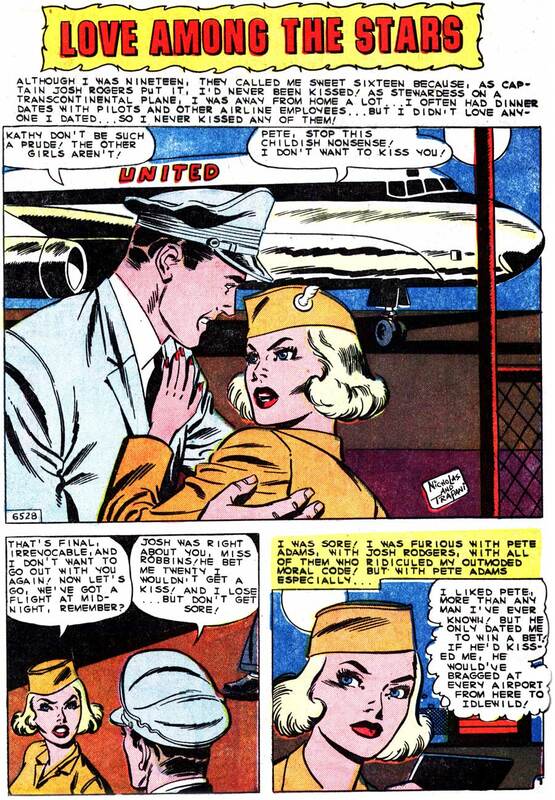 PANEL 1, SCENE: Flight Attendant Jill and Captain Jack are talking inside the plane. CAPTION: Jack was persistent, though! During the flight, he rushed out of the cockpit and cornered me...at a crucial moment! JILL: But...people are eating! I've got to hand out the barf bags before it's too late! JACK: Let 'em use their carry on bags! 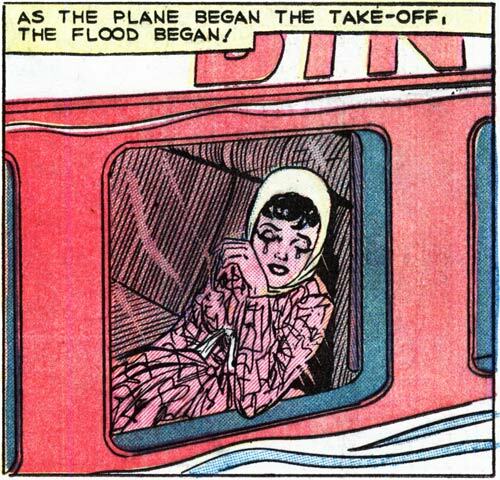 PANEL 2, SCENE: Jack and Jill are arguing as a passenger looks on. JACK: I've got to know now! Will you be my Valentine? JILL: Wake up and smell the coffee, Fly Boy! I can't be anyone's Valentine---not the way I cook! PANEL 3, SCENE: Passenger asks Jill something. PASSENGER: Stewardess, how about a gin and tonic? JILL: Sure, I could use a drink! PANEL 4, SCENE: Jill and Jack are talking again. CAPTION: "I was sure Jack had given up, but later in the flight I learned how wrong I was!" JILL: Y-y-you ate one of the meals I served? On purpose? JACK: I love you, Jill! To prove it...I even had a second helping! PANEL 5, SCENE: Jack and Jill talk. JILL: Oh, Jack! Even the...Brussels sprouts? JACK: Sure! <Burp!> Can't you tell? Click image to enlarge. Art by Charles Nicholas & Sal Trapani from the story “Love Among the Stars” in FIRST KISS #15, 1960. This story first appeared in Comics Buyer’s Guide #1371, the 2000 Valentine’s Day edition. And, quite frankly, it revolutionized Last Kiss. Without it, I doubt there’d still be a Last Kiss today. Last Kiss debuted in 1996 in the pages of Comics Buyer’s Guide. It ran haphazardly as an occasional feature using romance comic book covers that I rewrote—allegedly to make them funnier than the originals. These faux covers ran through 1998. Then I got busy and moved on to other things—forever, I thought. But in the summer of 1999, I ran into CBG editor John Jackson Miller and—to my surprise—found myself asking if he’d like a Last Kiss feature for the paper’s next Valentine’s Day issue. John said, “Yes.” So I whipped up this story. And Last Kiss was back in business. The story along with the cover I created were so well-received that Last Kiss was offered a spot as a regular multi-panel feature…which I continued doing until CBG folded in 2013. But by then, Last Kiss had found a new and much bigger audience here and on other sites such as GoComics. 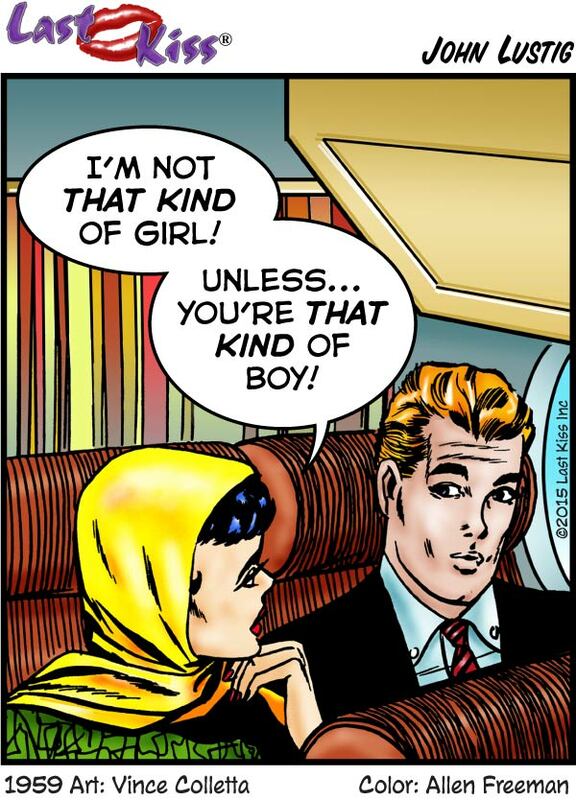 PAGE 1, PANEL 1, SCENE: A male pilot and a female flight attendant are talking outside a commercial jet. CAPTAIN JACK: Give up, Jill! It’s Valentine’s Day! And I’m so handsome I even turn myself on! Do yourself a favor…and kiss me! PAGE 1, PANEL 2, SCENE: Jill and Jack continue talking. JILL: I’d rather run naked…covered in honey…through a swarm of bees. JACK: Gosh! Who wouldn’t? Maybe we can go together sometime! PAGE 1, PANEL 3, SCENE: Jill is alone. JILL: Men are all alike! Sooner or later…Jack would want more than just wild passion and cheap thrills! He’d expect me to…cook for him! CAPTAIN JACK: Give up, Jill! It's Valentine's Day! And I'm so handsome I even turn myself on! Do yourself a favor...and kiss me! JILL: I'd rather run naked...covered in honey...through a swarm of bees. JACK: Gosh! Who wouldn't? Maybe we can go together sometime! CAPTION: "Then he handed me a Valentine...the big lug! I trembled as I read the card, but I refused to fall in love again! I couldn't take the chance!" JILL: Men are all alike! Sooner or later...Jack would want more than just wild passion and cheap thrills! He'd expect me to...cook for him! Art by Vince Colletta from the story “Lucky Liz” in FIRST KISS #9, 1959. SCENE: Woman and man sitting next to each other on a plane. WOMAN: I’m not that kind of girl! Unless…you’re that kind of boy! WOMAN: I’m not that kind of girl! Unless...you’re that kind of boy! Shirley wanted to join the Mile-High Club. But she had to settle for the Mile-Cry Club! SCENE: Woman crying as she sits in a plane. WOMAN (thinking): I knew he’d leave me! 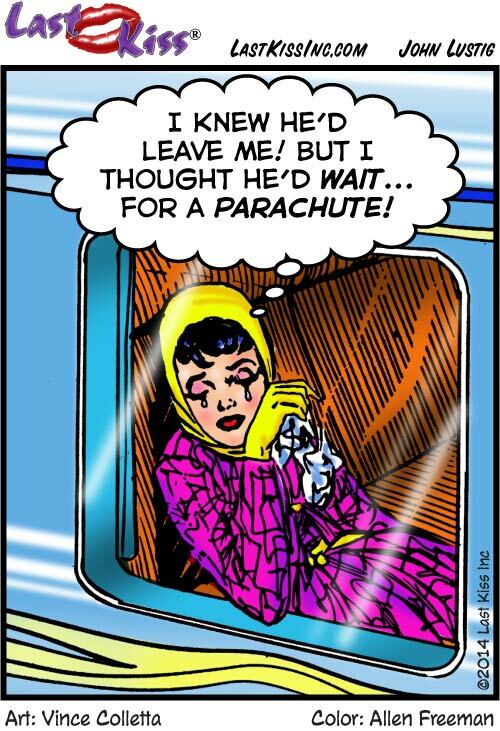 But I thought he’d wait...for a parachute!